At ACME Farms + Kitchen we have a passion for local food. We enjoy the challenge of finding and connecting with local growers and producers to find the best ingredients for our Locavore Boxes. It's especially fun to meet new people who care as much as we do about providing good food. By sourcing locally we're getting the freshest, most flavorful food possible. We're also financially supporting farmers and producers in our region ensuring that they can continue to grow and make food for all of us. We take great pride in providing healthy, clean food for your family and in our contribution to the food economy. When you shop with AF+K you make all of this possible. Taste the difference local can make. 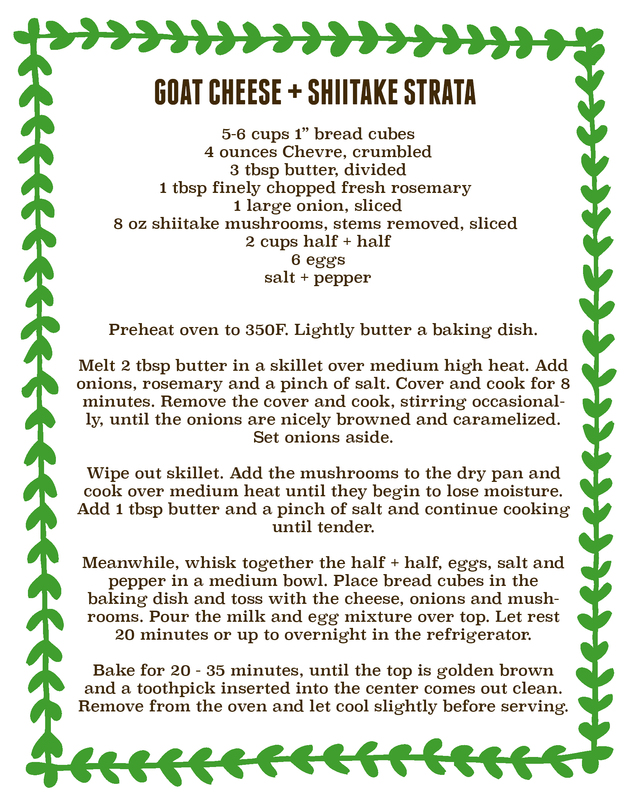 Try our Goat Cheese + Shiitake Strata Recipe using these suggested Portland area favorites. PS. We're excited about the new connections we're making in the Portland area. Look for future recipes featuring ingredients from Pasta del Sol, SweetHeart Bake Shop, Carman Ranch, Deck Family Farm, Gathering Together Farm, Rossi Farms and more. It's rough work, looking for delicious local food but we promise, we'll stick with it.